The New Melle Fire Rescue firefighters have a private account, the Firefighters Fund, which is funded from time to time with donations from the public or from small fundraisers of their own. This account is in no way funded from any tax dollars. 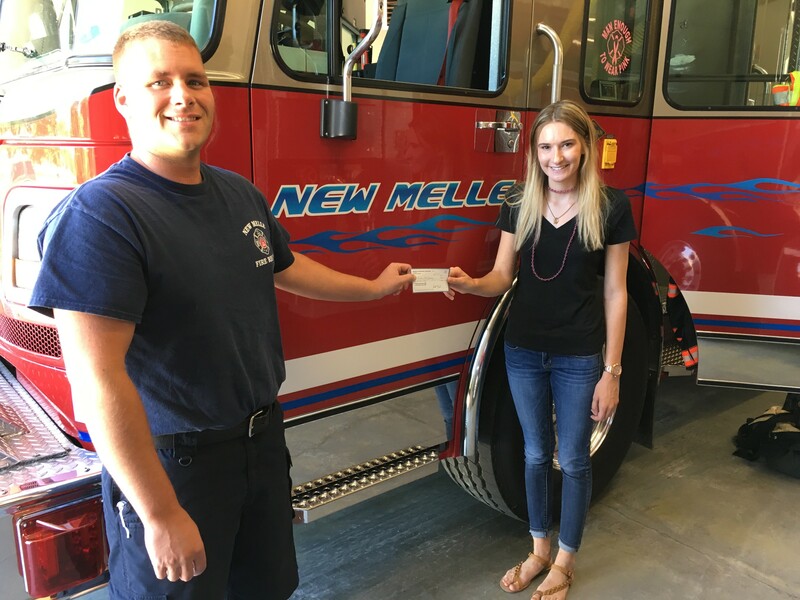 The New Melle Fire Rescue volunteer and paid firefighters decided for the thirteenth year in a row that they wished to offer a scholarship opportunity from their Firefighters Fund, which could be applied for by any resident within the geographic district covered by NMFPD. The opportunity was open to anyone, regardless of age, who was applying for any higher education program. While this scholarship could be applied to a full-time college education program, it could just as well be applied to a technical school curriculum or an EMT course, etc. In addition, the full-time paid firefighters of New Melle FPD decided to chip in and offer an additional donation from their own separate fund, again a private account that is in no way funded from tax dollars. 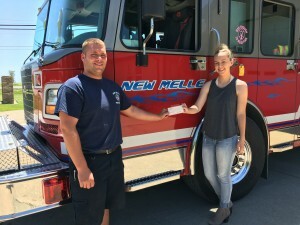 They were motivated to do this based on the significant public response to the program in previous years, and their additional donation enabled the department to match last year’s scholarship total of $1,000. This year, the $1,000 will again be offered as two (2) $500 scholarships, benefiting two (2) recipients. This year, a firefighter-based committee reviewed the eligible applications received. The review process this year was a significant challenge, as always. The applicants had outstanding records of academic achievement, along with profiles of numerous extracurricular and volunteer activities. Many accomplished all that while working part time as well. But after deliberation, the committee determined that the recipients of the two $500 scholarships offered this year are Madison Skambraks of New Melle Oaks in Wentzville, and Delaney Schmidt of Highway F in Defiance. Madison plans to attend the University of Central Missouri in Warrensburg in the fall, in pursuit of a bachelors degree in Secondary English Education. She hopes to use that education to teach high school English. Madison has participated in many local volunteer roles in our community, such as helping Daniel Boone teachers and volunteering at the community club. She has held various local jobs, while also working hard in high school to achieve honor roll and participate in FCCLA, FBLA, and FCA. She lists a fundraising program to help a young girl in our community with Cystic Fibrosis as one of her most satisfying accomplishments. Delaney has been a life-long resident of the New Melle area, living on a local farm, and plans to attend Tarleton State in Texas to pursue a degree in Agriculture Communications. Very active at Francis Howell on Student Council, FBLA, and NHS, she has also found time to work and volunteer extensively in the community. A major part of her time spent has been in various 4-H Club roles, including those of officer slots in the local club, and as state and national 4-H Congress delegate. We have some talented, hard-working people in our community, and Madison and Delaney are surely two of them. The New Melle Fire Rescue firefighters congratulate them on their commendable successes to date, and wish them all the best in future collegiate work. They also wish to thank all of the other scholarship applicants for their submissions, and wish them the best in their future endeavors as well.